I made this map awhile back When I was working on a Metroid project of my own with a small team. Its story was supposed to take place after Metroid Fusion with X's which made its way into escape pods and crash landed on a planet. The plot was basicly Samus lands and loses contact with the federation due to jamming from an unknown source. Samus after investigating 2 crashed Federation ships (whcih was sent on a failed mission to retrieve the X) comes across a Stone Guardian, which breaks the floor after Samus is defeated, into Chozo ruins where she gets back her old suit, but loses all her upgrades. The story progressed through worlds, pretty much upgrade, kill boss, advance to place you couldnt before, continue, eventaully leading into an old labaratory. In the bottom level tthere was supposed to be something like phazon but not, where the X was thriving, and where the final bos was, some kind of kraid looking monster in hissecond form. After he's killed, the materials in the area becomes highly unstable and Samus makes her get away as the planet is basicly destroyed xD The planet was supposed to be where the Chozo created the X (yes I know it went against metroid storyline, but it was just a fan game xD) and the last boss before you could get into the ship was a X infected Chozo. So what you guys thoguht of the idea anyway? ;P be nice now I bruise easily. EDIT: Spring Break just started here. Maybe I should try something during all the free time. I wish you had screenshots of the gameplay. I wish too xD all I had done really thouhg was the federation shipsand the overworld. made ht federation ships out of the tiles of the spire pirate ship-recolored, and the overworld was made from metroid fusion graphics. Hmm, I didn't know someone ripped the map sprites. And to think I was going to crappily hand-draw it on MSPaint! finish this or release an alpha. More 2D Metroid is good. Quoting Stalolin: finish this or release an alpha. It's a hangar. No real point to visiting those rooms, except to see Pirate ships and destroyed Fedaration ships. It adds to the atmoshpere, right? The whole place is being attacked by Space Pirates, and many hatches/passages have been destroyed. 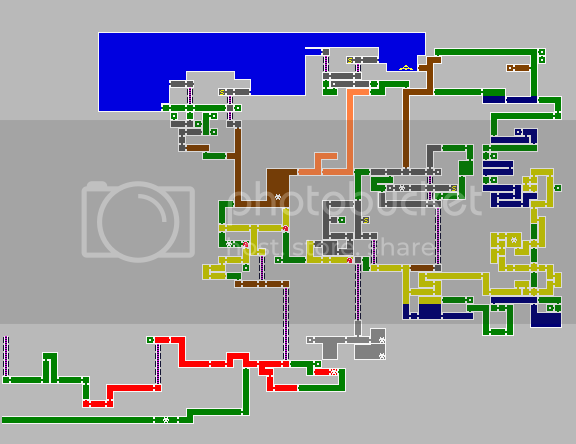 And an environment map, bcause I'm bored. D.Green: Little outdoor garden/break area. Quoting Zeta: It's a hangar. No real point to visiting those rooms, except to see Pirate ships and destroyed Fedaration ships. It adds to the atmoshpere, right? The whole place is being attacked by Space Pirates, and many hatches/passages have been destroyed. It not a station. It's actually a on a planet, in a city. And there's sewers everywhere in cities. Basically after the fight with Ridley the floor collapses into the sewer. Quoting Zeta: It not a station. It's actually a on a planet, in a city. And there's sewers everywhere in cities. Basically after the fight with Ridley the floor collapses into the sewer. Oh, when you said like ceres or space pirate frigate, and that there was anescape sequence, I assumed it was on a space station which was gunna self destruct at the end. By that I meant the 'intro area' thing, I wasn't implying it was a station. [quote]and that there was anescape sequence, I assumed it was on a space station which was gunna self destruct at the end. There is. After Ridley, the sewers and the vents are the escape route... Actually, I messed up a little. I should edit the map. Original. Edited the first post with the new one. Looks much better. What's that uber-long room on the bottom-left? That's supposed to be the quick path back from world 2, where you can use the spped boooser to get back from :) Speed booster is hidden in world 2. And... where is world 2? You say that as if large areas are a bad thing. The bigger the better! Quoting GameMiestro: It's just that the traditional approach is to divide the world into 4-6 distinct areas, and always have the final objective right next to the starting location, but impossible to access. Final area could still be connected to the starting area, no matter how big the areas are. I'm pretty sure the panel you need to step on to activate the collision sequence doesn't even appear until you pummel SA-X. Like how the boiler control panel doesn't activate until you beat the Wide Core-X. [quote=Zeta]I'm pretty sure the panel you need to step on to activate the collision sequence doesn't even appear until you pummel SA-X. Like how the boiler control panel doesn't activate until you beat the Wide Core-X. Lots of open runways, elevators connecting areas, and not nearly as many dead ends... you see what I'm saying. I always loved how all of SM's areas could fit together onto one map, unlike Fusion and Zero Mission. [quote]Err, they have that red security door in the way, so nobody could get in! You should be able to check after disabling the Lv.4 security, but before you go to Sector 6 to persue B.O.X. How's the Metroid Queen in Metroid 2 anywhere close tothe start location? MP2 wasnt that close either. If you did hack the game to get to the sellf destruct room, it wont work as theswitch doesnt activate until it's trigger goes off, which is why MFusion has no possible sequence breaks. You cant start a certain event until the even required before hand is completed. [QUOTE=Sk2k52]How's the Metroid Queen in Metroid 2 anywhere close tothe start location? [quote]MP2 wasnt that close either. Nah, that's actually pretty close to the Landing Site... I think. I forget what the Temple Grounds map is like. Hang on, I'm going to go check. I'm at Zazabi, so it shouldn't take too long. I know you can break sequence in Hunters, which is cool :) . Quoting GameMiestro: I already tried that, while I forget exactly why, I can assure you it's impossible to get back to that area before battling the SA-X. SAMUS DECIDED TO TELEPORT THROUGH SOLID WALLS, THATS HOW. Seriously, though, if I had an easy way of getting upgrades before actually beating the corresponding bosses, that would be just amazing. What would happen if I got the morphball before beating the Arachnid... Would it still be there if I checked several hours later? What would it's AI behaviour tell it to do if I wasn't in the room? Quoting GameMiestro: SAMUS DECIDED TO TELEPORT THROUGH SOLID WALLS, THATS HOW. No. Samus =/= X Parasite. [quote]And what if I somehow got the wave beam at the beginning of the game? Would I be able to damage the SA-X, and if so, could I have destroyed it early on? The programmers might've just made it completely invincible for the chases. And it's the Plasma Beam that hurts SA-X. [quote]What if I got the space jump before I fought that big tube shaped boss, and hid in a corner it couldnt reach? Would continue jumping at you, in vain. [quote]What I beat Trace BEFORE Noxus? Trace flees once you reduce his energy to half. [quote]What would happen if I got the morphball before beating the Arachnid... Would it still be there if I checked several hours later? What would it's AI behaviour tell it to do if I wasn't in the room? Huh, I'm kind of curious about that, too. I should get a rom and put some Gameshark codes in to try that. [quote]And it's the Plasma Beam that hurts SA-X. What if I got the Screw Attack early on, and went straight to Ridley's room? Would the ice statue still be there, since the action of me watching it get destroyed never occured? What if I got the Ice Beam before beating the SA-X, would I actually be able to freeze enemies with it? That was an "Oh, guess we we're wrong'' thing. And it IS the Plasma Beam, as it pierces enemies, while the W.Beam goes through walls, and I don't think SA-X is a wall. [quote]What if I got the Screw Attack early on, and went straight to Ridley's room? Would the ice statue still be there, since the action of me watching it get destroyed never occured? [quote]What if I got the Ice Beam before beating the SA-X, would I actually be able to freeze enemies with it? The programmers probably didn't even add a freezing property, since the Ice Beam was intended for the Omega Metroid battle only. [quote=Zeta]That was an "Oh, guess we we're wrong'' thing. And it IS the Plasma Beam, as it pierces enemies, while the W.Beam goes through walls, and I don't think SA-X is a wall. Good point =/ I should check that, too. [quote]Would your ship be in two places at once? What? It's only ever in one spot. [quote]Would you be able to fight the Chozo hologram... with your suit on? Yet another thing I should check if I rom+GS. The Chozo Orb might only be affected by the Stungun. Scenes in Metroid Fusion is triggered by your items. If you have the wave beam, it'll add the trigger allowing the boss after it to be fought. If you got the morphball by hack, the boss that normally would give it wouldnt exist, and the next boss in line would. BTW you can never gain the means to fight the SA-X and encounter it, once you do, all references of it is removed all they way until you trigger the boss fight between the SA-X. Theorize as much as you wanted to, but the way Metroid Fusion was made, sequence breaking besides missles/engergy/power bomb tanks is impossible. btw, getting power bombs before you get the power bomb upgrade wont give you power bombs. [quote]You must spread some Reputation around before giving it to Sk2k52 again. What if you gave yourself the morphball mid-battle? Would the boss just dissapear? Ya momma so poor, when I came to your house and lit a match, she yelled, "Clap your hands and stomp your feet, praise the lord for we have heat." Ya mamma's so poor, she couldn't even afford window shopping. Honestly, I could try and make a Metroid game on GameMaker, but it would take a huge amount of artwork and sounds, only a little of which I have. I'm going to try using some of the sprites that Sk2k52 had a link to in order to make a movable Samus, which is a nice first step. Want to help? Quoting GameMiestro: Ya mamma's so poor, she couldn't even afford window shopping. If you could actually make an engine if not, its not worth trying. A working Metroid engine on GameMaker would be hard to create, and you'll spend 95% of all the work on the game just on the engine. [quote=Sk2k52]If you could actually make an engine if not, its not worth trying. It wouldn't be exactly like the normal game... centering the screen like in the games would be frusterating, and require a lot more commands than otherwise. Though if I could get Samus to move right, then it might be worth it later on. [quote=Sk2k52]Actually, they dont use any complete sprites. They actually broke the sprites into 4 seperate sections, and made each section in seperate from the whole, so it's referenced whenever an action is done. I'm just going to use the complete sprites, as it gets the job done just as well, but requires a little more patience. Quoting Sk2k52: and Zeta, SoTN? Symphony of the Night. The first of the Metroid-style Castlevania games. Now I'm the one that needs to ask. A GameMaker game that can run on it's own (thats an example). In other words... I WANT TO GET SOMETHING THAT ISN'T AN IMAGE OR VIDEO FILE ONLINE, BUT I CANT FIND A COMPATIBLE HOST. check out filefront, only ever used it for videos thoguh, so I don't really know if they can host other files. You could try freewebs too, but it tends to have things downloaded extremely slowly unless you dish out the doe. Well, I've tried about 20 different top file hosts, and all of them are ****. Anyways, I have a vague idea about how I can pull the file sharing off, so I'm okay with that. In other news, do you want to see my sad attempt at imitating Samus's physics? Click this (I hope the link works)- [URL="http://www.filefactory.com/?00a082"]http://www.filefactory.com/?00a082[/URL]. Arrows move, space shoots, control jumps. You gotta understand that trying to do this on a computer is somewhat trickier than on a console- on the GBA, you can't press opposite directions at the same time, so shooting feels wierd on a PC. Quoting GameMiestro: Well, I've tried about 20 different top file hosts, and all of them are ****. Anyways, I have a vague idea about how I can pull the file sharing off, so I'm okay with that. Feels very nice and comft to me. Fine, fine, I'll change the controls to that... you can actually use diagonals with shift now. EDIT: I'd make a seperate thread for this, but it's not even close to finished, so if it's okay, I'll just keep it here.